Bunson the Hot Dog is a giant Hot Dog boss. He originated as a normal Hot Dog, but was altered by Kamek's magic during the events of Yoshi's Woolly World. He grew to gigantic proportions, and is covered by flames. He is the main boss of World 2. One of Bunson's main attacks is spitting small fireballs at Yoshi; Yoshi can turn these fireballs into Yarn Balls. In order to damage Bunson, Yoshi must throw a Yarn Ball at his face once it changes to a grayish coloring. This causes Bunson's attack to backfire, stunning him, and exposing his tongue. Afterwards, Yoshi must Ground Pound Bunson's exposed tongue to deal damage to him. 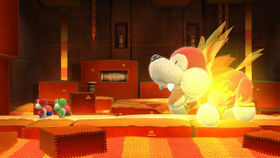 After taking damage, Bunson jumps in the background and tries to damage Yoshi by breathing a stream of fire at him; the stream travels even faster once Bunson has been damaged twice. He also tries to attack Yoshi by landing on him, but Yoshi can avoid the attack when Bunson jumps high enough. Three Ground Pounds onto Bunson's tongue defeats him. Bunson, as he appears in the Scrapbook Theater. Bunson's mouth wrapped by yarn, after being hit by a Yarn Ball. Bunson's name is a reference to Robert Bunsen, the inventor of the Bunsen burner.